Now aren't you feeling happier already? CLUTCH CONTROL: A summer design in fall colors means versatility, baby! 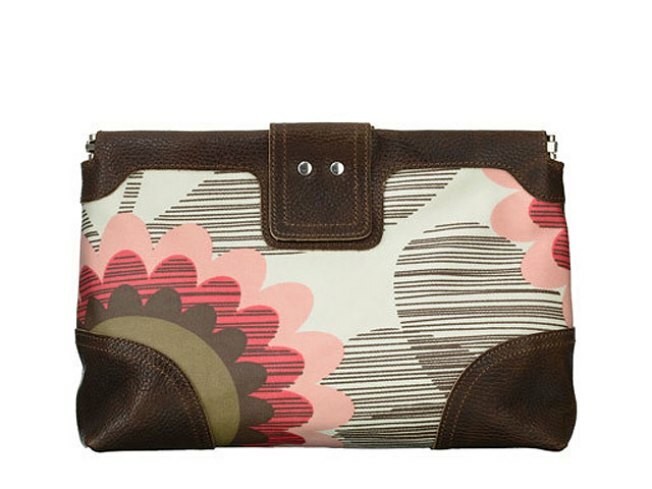 Orla Kiely's giant sunflower clutch (was $187; now $98) comes in raspberry (pictured) and what's called "apple," but we'd rather call apricot, because we're contrary that way -- and also, it's pale orange. Either way, we like it. Available at Hysteria (125 S. Fairfax St., Alexandria). HATE TO WAIT? Polaroid is more of a living memory at this point, but nothin' says retrofitting like the Fuji Instax 7S Instant Camera ($99.99), reports New York Magazine. With a Apple-esque white plastic exterior and a bulging Homer Simpson eye of a lens, this instamatic has exposure control, an automatic built-in flash and 0.6m-to-infinity focusing. You'll get full-color, credit-card-size pics in a hot sec. FALL'S CALL: We have serious Fall Fever (yes, in big important capital letters), and the District Sample Sale is still nearly a month away. Get into the spirit with sale goodies from Proper Topper (3213 P St. N.W. and 1350 Connecticut Ave. N.W. ), including some delightfully season-forward items like a chocolatey Maggie Ward dress (was $195, now $99) with a built-in mini scarf -- or Burning Torch's recycled army jacket (was $410, now $290). Blazers with bold shoulders are going to be big this fall, but why not skip the usual colors and go for the unexpected?